I started a new job in early May, and I have not had much time for blogging since. This weekend, though, Scott is out of town and I’m on my own. I decided to cook myself something nice. We had some frozen salmon in the freezer, so I decided to try something I haven’t done before — cooking it on a cedar plank. A 400 degree oven, a little garlic and honey for a glaze, and 15 minutes later, the salmon was tasty and cooked just how I like it: still slightly raw in the middle. I picked up a few mushrooms as well, and did them very simply. A hot pan with a dash of olive oil,cook until they’re almost done, then deglaze with white wine, and finish with a pat of butter. As promised, here’s the penne alla vodka recipe Scott made for my birthday dinner. 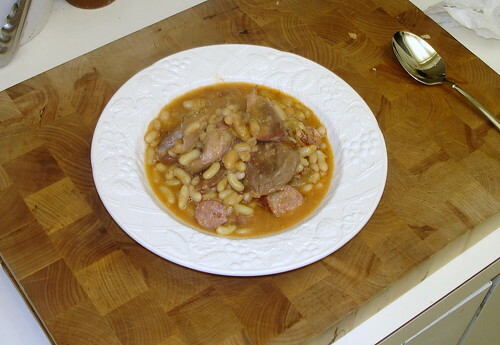 Vodka is not native to Italy, and Wikipedia has three different versions of the dish’s origin. The one with the most detail says that the dish was invented in New York. I don’t know if that’s correct but it sounds plausible. At any rate, it doesn’t really matter – authentic Italian or not, penne alla vodka is really good when made well. 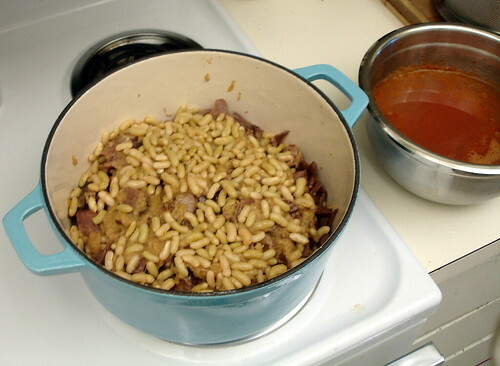 Bring a large pot of salted water to a boil, then cook the penne until it is al dente. If you time it right, you should be able to start the water, then the sauce, and the pasta will be ready for the sauce at just the right time. If you’re not that confident about the timing, it’s better to have the sauce waiting for the pasta than vice versa. Overcooked pasta = epic fail (and not very tasty either). Put the olive oil into a large skillet over medium flame. 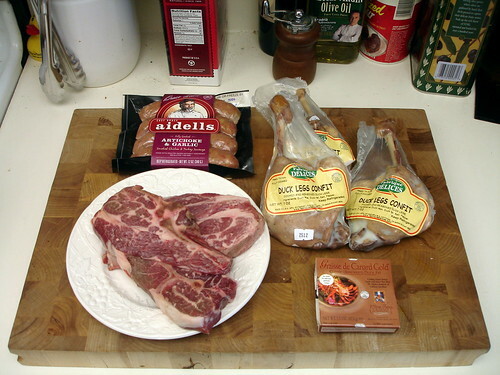 Dice the pancetta and add it to the skillet. Cook until dark and crispy (but not burned). 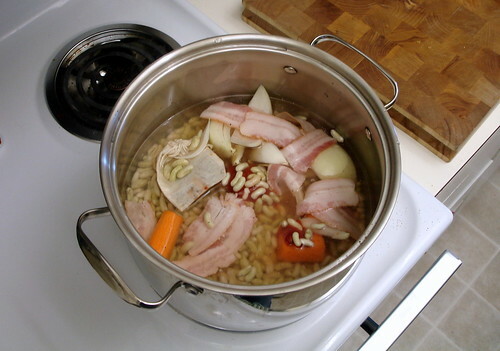 Remove the pancetta from the pan with a slotted spoon and place the pancetta on paper towels to drain. Add the garlic slices to the pan and sauté until they turn light golden brown. Add the tomato sauce to the pan, stir to deglaze, and turn the heat to medium-high. Bring the tomato sauce to a low boil, then add the salt and red pepper flakes. Keep the low boil going for 5 minutes, then turn the heat down to low and add the vodka. Stir in the cream, pouring slowly, then keep on stirring as you slowly add the cheese. Tip: don’t add the cheese until the pasta is ready to go. When the pasta is ready, drain it and put it into a large bowl. Pour the sauce over the pasta, sprinkle the parsley and the pancetta on top, and toss to mix it all together. Serve immediately. Serves 4 to 6, depending on whether you’re doing it as a main dish or an appetizer. This is one of those recipes where the quality of the ingredients you put into it is absolutely critical. We tried this one night with some pre-cut shrink-wrapped pancetta and it was nowhere near as good as when we make it using freshly-sliced pancetta from a good deli counter. Get the good stuff. It matters. The same goes for the Parmigian cheese. Don’t even think of using that stuff in the green can. Get the real thing. If it’s winter or you don’t have roasted tomato sauce on hand, a 28 ounce can of tomatoes will do fine. Use whole tomatoes and quickly puree them in the blender, don’t buy the pureed ones. Again, quality is key. Use San Marzanos if you can get them. If not, Progresso is a good fallback. 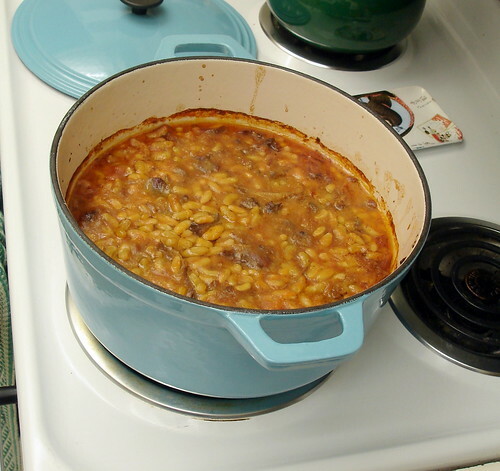 Chilly Saturdays are good days to settle in and do the longer cooking projects you can’t do on a weeknight. Today, I took some salmon out of the freezer, and got inspired to make my own pasta rather than go out and buy a box of tagliatelle like I usually do. Making pasta is not at all difficult, especially if you have a basic pasta machine to help you along, it’s just time consuming. Allow at least two hours if you’re going to make a batch. More authentic Italian cooks will use the ‘well’ method to start their pasta – the put their flour out on a flat wooden surface, make a hole in the top of the flour, crack the eggs into the hole, and then use a fork to start bringing the dough together. I’m not quite that authentic, so I put all the ingredients into a big metal bowl and used a wooden spoon to start the dough. You could even use a food processor if you wanted to, although it’s not really necessary. Whichever method you use, the dough will come together within a minute or two of mixing. 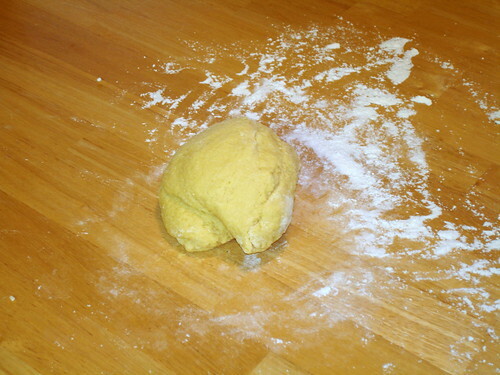 Then, dump the dough out onto a large, flat surface (I use our wooden dining room table), dust with flour, and start kneading. One thing about pasta dough is that it’s not a perfect science. The humidity in the air and the size of the eggs you use may mean that one day your dough will be a little wet and other days a little dry. If it’s dry, add water a tablespoon at a time until it’s damp enough to work. If it’s too wet, you can work extra flour in as you knead. You’ll have to judge it by feel. Once the dough is kneaded, divide it into smaller pieces to make it easier to work with. I rolled the dough into a cylinder and then cut in into 6 pieces. 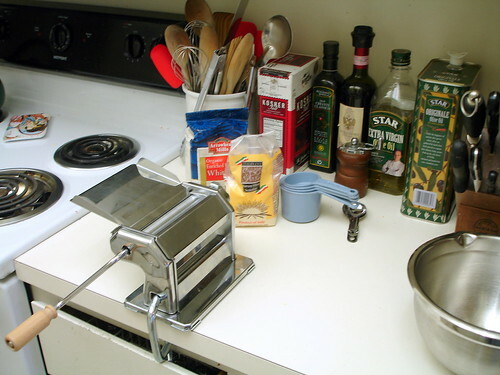 If you have a pasta making machine, here’s when you start to use it. You don’t absolutely need one, but it does make things a lot easier. Assuming you do have a pasta machine, start feeding it through at the widest setting and slowly work your way down to the next-to-thinnest setting. I aim to get each sheet of dough roughly 18″ long (the length from the tips of my fingers to my elbow), but this is not an exact science. 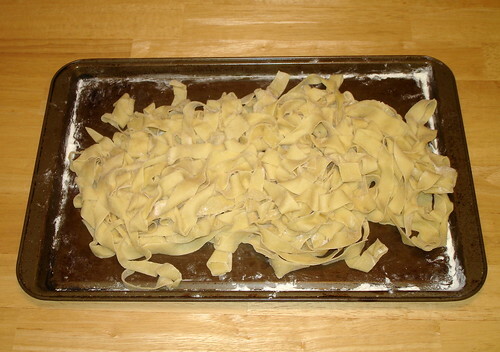 Once you’ve gotten the sheet of pasta dough to about the right size and thickness, dust it with a bit more flour, loosely roll it, then slice the dough into 1/3″ noodles. It’s OK to cut them thinner or wider if you prefer. Place the batch on a baking sheet or other convenient flat storage area and start rolling the next sheet. Rolling the pasta is by far the longest part of making pasta. Don’t rush it — try to find the Zen of the process. The result will be worth it. This batch went into a fantastic lemon cream sauce with asparagus — I would post the recipe, but it’s from the excellent “Cucina Viansa” cookbook, and I don’t want to get into copyright trouble. 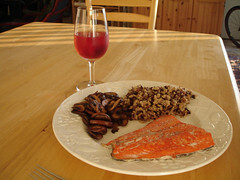 Oh, and the salmon? Pan-seared and topped with a dash of vinaigrette. No, I didn’t get a photo, sorry. I was too busy chowing down on my fantastic tagilatelle. 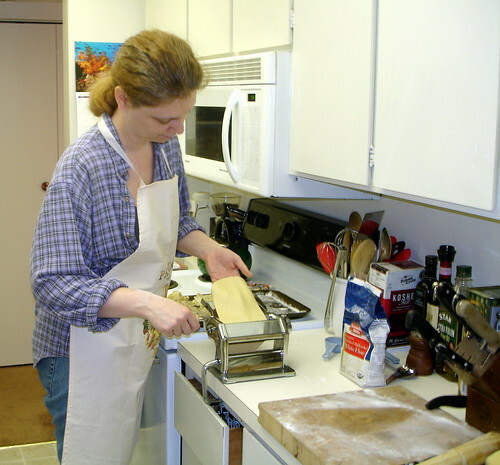 If you do not have a pasta machine, you can use a rolling pin and elbow grease instead. There’s nothing magical about a pasta machine, it just does the same job a little more evenly and precisely. Just in time for Chanukah, here’s my maternal grandmother’s latke recipe. Grandma B was born in the Lodz ghetto, and came to America as a child, fortunately long before the horrors of WW2. She loved parties and gathering her family around her, and Chanukah was no exception. Wash, peel, and grate the potatoes, drain over a large bowl. Discard the potato water but keep the starch left at the bottom of the bowl. Beat the egg whites with a fork until well mixed. Mix the onion, garlic, egg yolk, salt, and pepper all together with the potato starch. Add the matzo meal and beaten egg whites, continue mixing until all ingredients are nicely mixed together. Heat about 1/4 inch of oil in a heavy skillet. 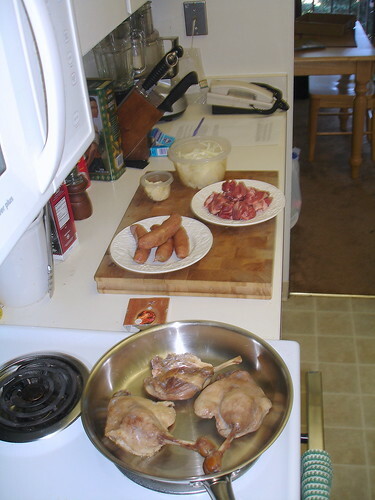 Drop heaping tablespoons of batter into the oil and fry until golden brown on the bottom. 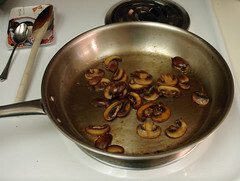 Flip, continue frying until second side is also brown. Remove from heat, drain on paper towels. Frying oil. Grandma’s recipe calls for corn or peanut oil for frying the latkes, but as The Jew and The Carrot reminds us, these are not the healthiest possible choices. Canola oil is a good alternative.